If you’ve been following my blog since the beginning, you probably already know my love for blueberries knows no seasons. They are, without a doubt, my favorite fruit! In the Summer I easily eat 5 pounds a week. And when I find them on sale – in the middle of WINTER – I buy in bulk, baby. Last week I hit the jack pot, finding fresh, organic blueberries for just 2 bucks a carton. I have to confess, I cleaned them OUT. So many blueberries = so much happy! After inhaling a few cartons by the handful, I got to business, baking you some fabulous new recipes. Last week it was these Greek Yogurt Lemon Blueberry Scones, and today? 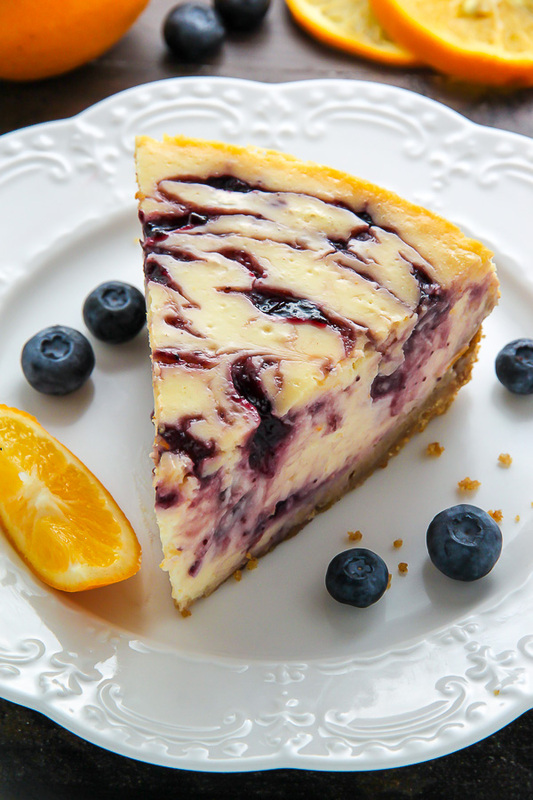 Lemon Blueberry Swirl Cheesecake!!! 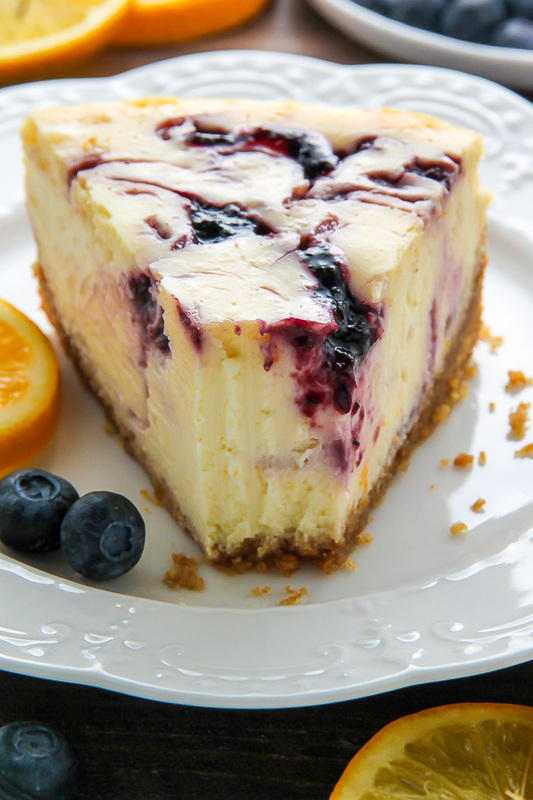 This better-than-the-bakery lemon blueberry cheesecake is made up of 3 parts: the graham cracker crust, the lemon cheesecake filling, and the blueberry swirl sauce. If making a cheesecake from scratch seems intimidating, fret not my friend– I’m going to walk you through each step. 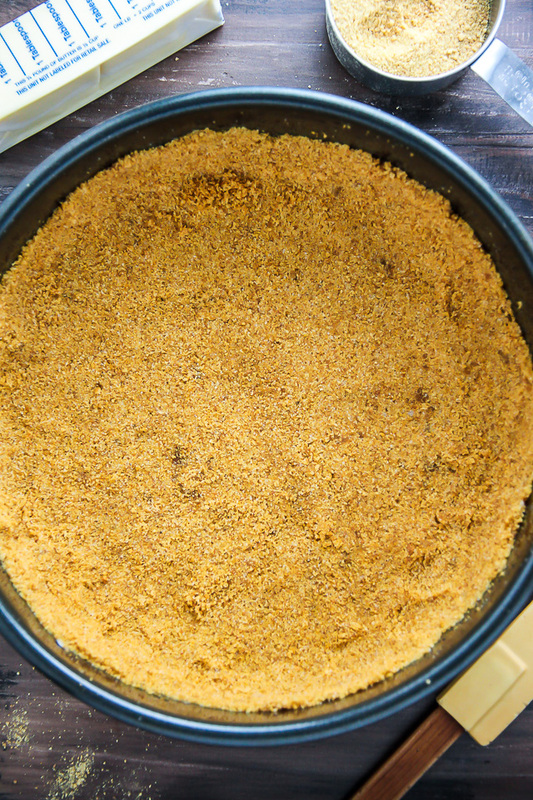 Making the graham cracker crust is the first step in this recipe and it’s an extremely easy one. Ingredient wise you’re going to need graham crackers, melted butter, sugar, and a pinch of salt – that’s it! You will need to pulse the graham crackers into crumbs, or – if you want to make things even easier – you can buy already crushed graham cracker crumbs at the store. I typically find them in the baking aisle, somewhere near the pie fillings. To assemble the crust you’ll combine the cracker crumbs, sugar, and salt, then fold in the melted butter and stir until it’s well combined. You want all of the crumbs to be moist from the butter. Then you’re going to dump the crumb mixture into a lightly greased 9″ springform pan and press it down firmly, working from the center and slightly up the edges. For the cheesecake filling you’re going to need cream cheese, sour cream, eggs, egg yolks, sugar, vanilla extract, fresh lemon juice, lemon zest, and a spot of flour. A Few important things! Your cream cheese MUST be verrrrry soft before beginning. I typically leave my blocks of cream cheese out on the counter for at least two hours before I plan on baking. It’s also important to have your eggs, egg yolks, and sour cream at room temperature. If you’re unfamiliar with the water bath process, read on! A water bath is, simply, the term bakers use when they place a baking pan (in this case, our cheesecake pan) into a larger pan that’s been filled with hot water. Taking this extra step helps insulate the pan from direct heat on all sides while it bakes. 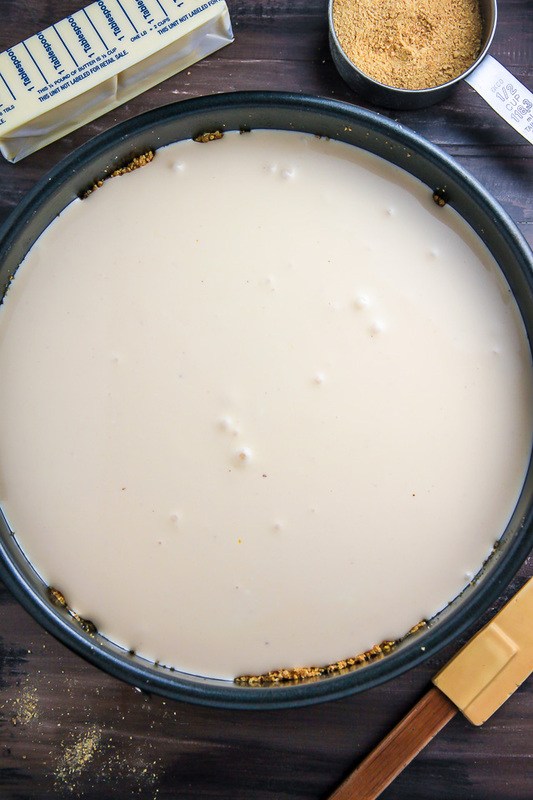 The water bath method helps your cheesecake bake gently, ensuring the finished product doesn’t burn, curdle, or crack. 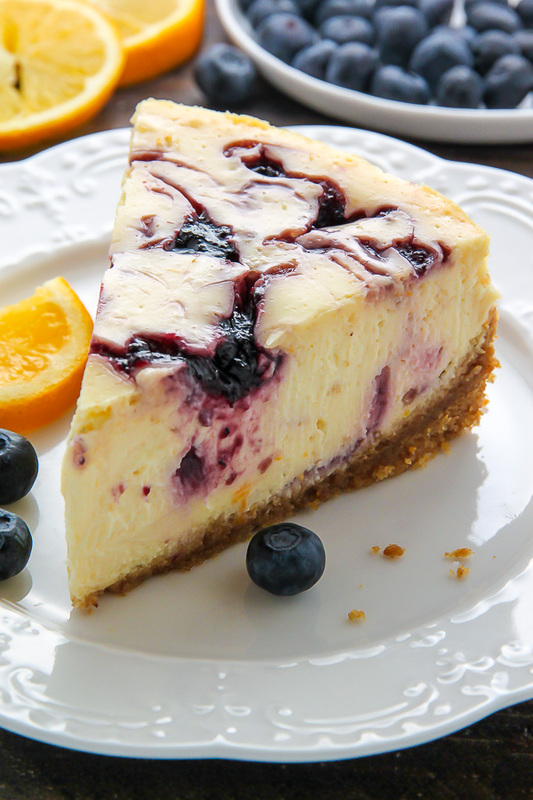 It also helps the cheesecake maintain its silky smooth texture. When it comes to choosing a pan for your water bath, choose one that is as tall as the cheesecake pan and large enough to leave a few inches between the cheesecake pan and the outer rim – you want enough room for the water to circulate easily. When you’re ready to make your water bath, here’s what you do: Adjust an oven rack to the middle position. Preheat oven to called for temperature. 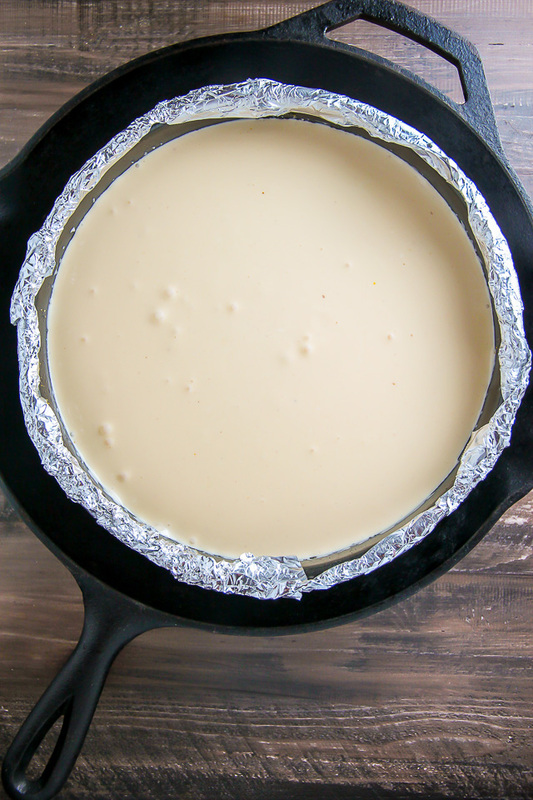 When the oven is preheated, carefully (using an oven mitt) pull out the middle rack and place your large pan on it, fill the pan half way with hot water, then place the filled cheesecake pan in the center of the water bath. Slowly slide the rack back to its full inserted position, close the door, and bake the cheesecake according to instructions. If you’re using a spring form pan it’s essential to wrap the pan in heavy-duty tin foil to avoid water seeping in. I wrap my pan from every possible angle pressing the foil in and around to prevent a soggy crust. I use my large skillet as a water bath and it works great. Visual below in case you need it. The blueberry swirl sauce is probably the easiest part of this entire recipe. You will need a small food processor or blender to blend the the blueberries smooth. Then you’ll press this mixture through a fine mesh strainer, getting rid of the seeds and pulp. Add in a little sugar, and you’re all done. 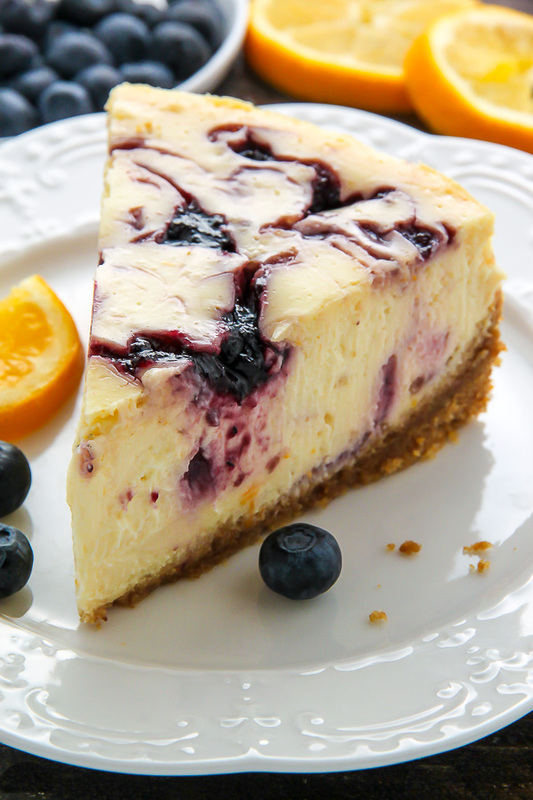 To swirl, you’ll dollop the blueberry mixture on top of the unbaked cheesecake batter by the spoonful, then use a skewers to swirl. I don’t recommend swirling to much, or the end result will look messy. Keep in mind this cheesecake needs to chill for at least 6 hours before being sliced and serve. So are you ready for a slice of this cheesecake, or what? 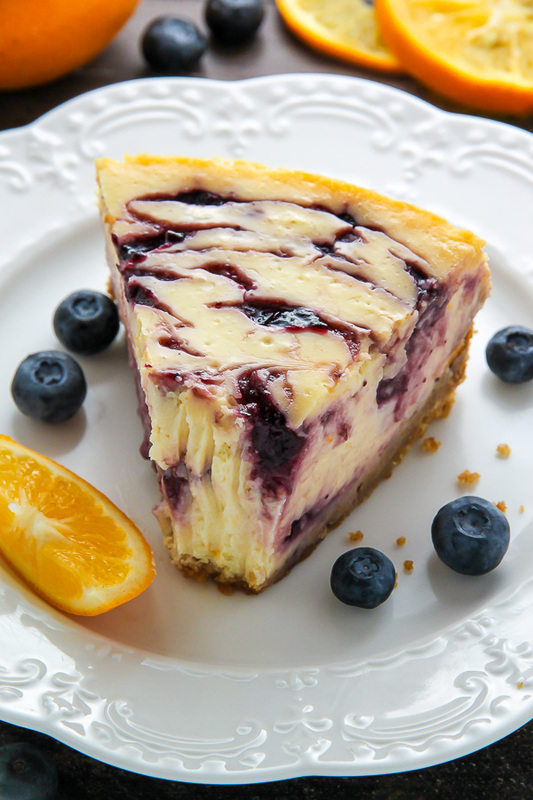 Sweet and supremely creamy, this easy-to-make Lemon blueberry swirl cheesecake is the perfect addition to any dessert table! 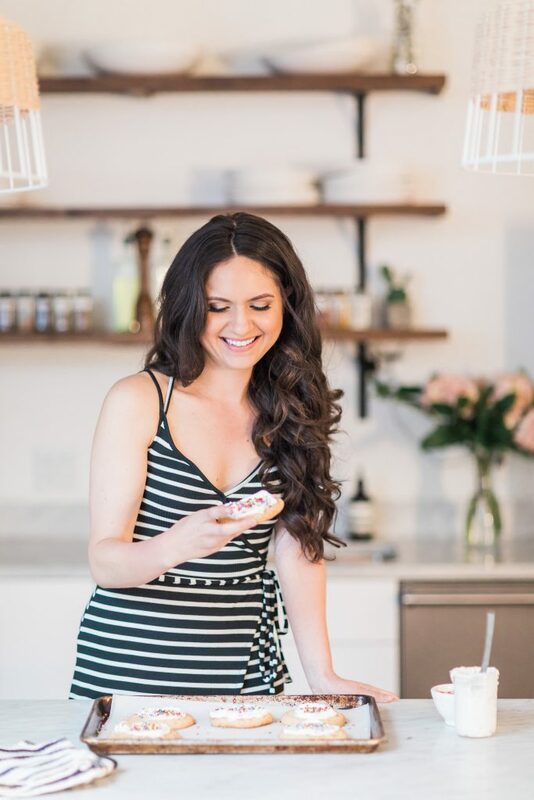 In the body of a high power blender, food processor, stand mixer fitted with the whisk attachment, or in a large bowl using a hand held mixer, beat the softened cream cheese and sour cream until smooth. Add sugar and vanilla; beat until smooth, scraping down the sides and bottom of bowl as needed. Add in the eggs and yolks; beat until smooth. Stir in the flour, mixing just until combined. Quickly stir in the lemon juice and zest, mixing just until it's incorporated in the batter. Pour filling into prepared crust, and spread the top smooth. Add blueberry swirl. Wrap the bottom of the pan in tin foil (I highly recommend doing several diligent layers here; no one wants a wet/soggy crust). Place pan into the preheated oven and bake for 1 hour and 20 minutes. Turn the oven off and let the cheesecake sit, undisturbed, for 45 minutes inside the oven, with the door shut. The cheesecake should be still slightly wiggly. Remove the cheesecake from the oven, run a knife very gently around the edge of the cake, and let it sit in the pan for another 15 minutes before covering loosely with plastic wrap and refrigerating for at least 6 hours. In a small food processor or blender, puree the blueberries until completely smooth. Press the mixture through a fine mesh strainer, discarding seeds and pulp. Stir in the granulated sugar. Spoon the blueberry mixture on top of the unbaked cheesecake, a few dollops at a time. Use a skewer to swirl the mixture as much or as little as you'd like. Bake cheesecake as directed above. *It is very important to bring your ingredients to room temperature when baking cheesecake - especially the cream cheese. I recommend sitting the blocks of cream cheese out on the counter for at least 2 hours prior to baking. *Full-Fat cream cheese and sour cream is what was used for this recipe and what I find yields the best results. Using reduced-fat or non-fat versions will alter the taste and texture of this recipe. *Meyer lemons may be used in place of regular lemons (In fact, that is what I used the final time testing this recipe). *Cheesecake (without any whipped cream on top) may be sliced and frozen for up to one month. *If you have any questions about the water bath prior to baking, please feel free to ask and I will walk you through it. *Table salt may be used in place of kosher salt. This looks absolutely beautiful I’m obsessed with your blog and I literally just found it all of your recipes are amazing! Could this be any prettier?! I am buying blueberries tomorrow to make this. I so love your recipes. If I want to avoid using lemon juice what should I substitute it with? Hi Kyra. For best results I do recommend using a springform pan. A standard cake pan will not be deep enough to hold all the batter. HI! I found your blog through Pinterest! I just tried your recipe only I used blackberries because I already had them on hand. It’s in the oven currently but I’ll send a pic when I’m ready to serve it tonight!! Can’t wait to hear how it turned out, Jessica! I had to try this mostly out of curiosity. I make cheesecakes as a profession and I’ve never made one without baking the crumb crust first. I don’t know how yours turned out but the crust was a mushy wet mess. The filling was good but the blueberry swirl needed some tweaking. Hi Patricia. I’m sorry to hear your crust came out messy. Did you wrap the pan in heavy duty foil? Mine turned out to be a mushy mess too 🙁 Very disappointed after going to a berry farm yesterday to pick berries and then spending so much time making this recipe. Next time I’ll try a different recipe that doesn’t involve a water bath. Hi Rae. I’m sorry you had issues with this recipe. I know how frustrating that can be! Did you let the cheesecake cook in the oven and then cool for 6 hours in the fridge? Also, what was a mushy mess? The whole cheesecake? Or the crust? Do you think subbing cornstarch for the flour would work? If so, how much would you use? (Glutten intolerant chick here.) I know where to find glutten free graham crackers, so just trying to think of a way to alter the filling. Thanks for any help you can give! This cheesecake has great texture; very light and creamy. The swirl looked cool, too. I over swirled and and it gave the top of the cake a neat marbled look. I was disappointed in the water bath, though: Four layers of tinfoil and the water still seeped through and the top still cracked. Thank goodness the swirled blueberries disguised the cracks. Try putting the pan of hot water on the rack under the cheese cake. And not put the cake in the pan of water. I do my cheese cakes that way and it works just as well without water getting into my crust. Is it possible to do without water bath? If so does that change the cook times? So my grandmother taught me what I know. Im the type that just goes for it and my friends and family eat it. so far ive never had a NO. But with a family reunion in a week and a few days away my grandmother left me in charge of desserts. I came to the thought of a lemon blueberry cheese cake. light fluffy yummy what more could you ask for???? I cant wait to make this next Friday ( yea I get to spend my 29th birthday baking which Im actually excited for) I wanted to say thank you for this. I could not throw this one together for people I do not know. Fingers crossed it goes well and I will let you know how it goes!!! Given that it cooks only at 325 and for an hour and 20 minutes and it cools in the hot oven for 45 minutes and it cools for hours after that, how much room for error is there based on variations of oven heat distribution and cooling? Mine looked a little more than jelly jiggly. I might have let it cook another 4’ish minutes before shutting off the oven. I’ll see how it turns out. but good lord, the badder tasted so good! Hey Dan. Did it firm up for you? Hey, when doing the water bath, the only pan I had large enough is a thick glass one, can I put glass in the oven? I checked to see if it was heat/oven proof but I couldn’t find anything. Hi Shariah. It would definitely need to be oven safe for you to use it as a water bath. 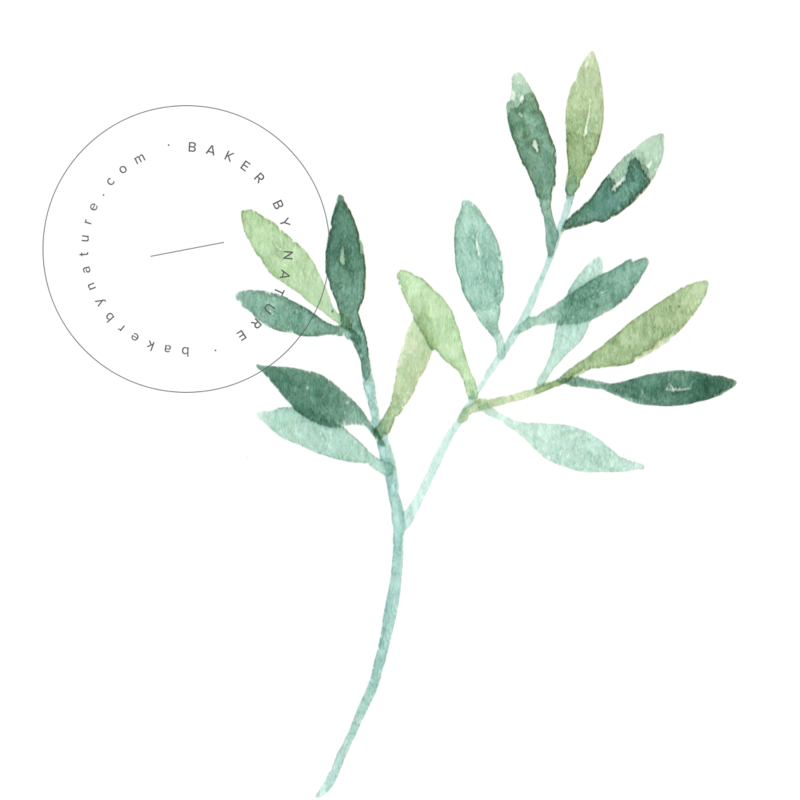 Do you know the brand of then pan? You may be able to google it and find out that way. I made this last night and put it into the fridge this morning to chill. Arguably the best lemon blueberry cheesecake I have ever eaten. The tartness of the lemon with the blueberries really bring out the best in the dish. I used blueberries in a tin with syrup and left some of the blueberries whole which added to the fresh taste . Simply delicious . SO GREAT! First time making a cheesecake, followed the instructions very carefully, and it was amazing flavour and a hit with guests. The water did get through 4 layers of foil, but my pan luckily appears to be watertight and the crust was excellent. I felt like a pro serving this up! Definitely going into my recipe box. So happy to hear this, Danica! Hi! Thank you for the recipe! New baker here. The filling tastes great but only about two inches in from the crust firm up. Made it twice now in the last week and the same thing happened both times. The two cakes look identical. Is it possible I need to bake it longer to get the middle to firm up? Hi John! Sounds like you may need to bake it a little longer. I would recommend adding 20 minutes. Also, are you letting the cheesecake sit in the oven and then cool completely before serving? It firms up a lot as it chills. Hi! Thanks for the reply. Yes, I let it cool in oven and chill in fridge overnight. I’ll add some time in the oven…Keep you posted. Hi I just finished making this cheesecake and it looks fantastic. Only thing is it is very jiggly. When I ran the knife around the edge of the pan it seemed to be still very wet . Would it be advisable to put it back in the oven for some more time? I read some comments that stated it would firm up once it was refrigerated. I’m just not sure its done. I think I will put it back in for about 20 minutes and let it sit for the 45 minutes again, then chill in fridge. Hope it comes out alright. Hi Angela. It should be jiggly in the center. It firms up a lot during the 6 hours in the fridge. How did it turn out? My crust came out soggy too. I’m curious why it’s not baked first and then the filling is added. Also, if I were to make it again, I’d back off on the lemon juice from 3/4 cup to 1/2 cup as it seemed to be dominated by the tartness of the lemon. I would also increase the blueberries from 3/4 cup to one cup as a carton is typically one cup and the blueberry swirls were not evident. Finally, there’s a discrepancy in the cooking time. Up top in the summary is says 1 hour, 30 minutes, but the body of the instructions says 1 hour 20 minutes. Can I make this the day before? I am hoping to make this for Easter lunch this year! Absolutely! It needs at least 6 hours to chill, and can be stored for up to 3 days in the fridge. I read all the comments and didn’t see this. you put1 1/4 cups of sugar and 2teaspoons of vanilla in the ingredients list,yet no where in the instructions do you add them in to the recipe? The cake was a little soft when done. I haven’t checked this morning to see if it has firmed up, the taste was good though. Also in the instructions # 10 doesn’t actually tell you to remove the ring from the cake, this might confuse some first time cheesecake bakers. Looks great! You’re writing 3 packages full fat cream cheese (8ounce). Does one package to be 8 ounce or the 3 packages in total? Thanks for answering. I’m going to be making this in a commercial kitchen, and I won’t be able to leave it in the oven for 45 minutes. Will the recipe still come out fine, if we remove it from the oven? Hi Lucius. This step is important as is helps the cheesecake cool slowly (which prevents cracks). I would suggest doing the oven step for at least 10 minutes, then cooling the cheesecake completely (in the spring form pan). I just made this however the batter was VERY watery….I’m worried. Just put it in the oven and hoping for the best. I just wanted to confirm that it was watery for everyone else. It’s firming up great. Thanks for the quick response. If it turns out like when i made it 6 months ago I will be in heaven. Amazing recipe! I have graham cracker crumbs already. Any idea how much I would need instead of crushing two cups of graham crackers? Thanks!! I only had two eggs at home so I just used them both, will this affect the recipe in any way? Yes, it will. The cheesecake will likely be less moist and creamy. Would greek yogurt work as a substitute for the sour cream? I’ve got this recipe currently in the oven, but it was a bit confusing at times. The instructions for the blueberry portion weren’t in chronological order, so I had to go hunting around for them. Also, the blueberries in the photo look to be a lot “chunkier” than what the instructions described. Hoping it turns out! It looks delicious! Also, are you supposed to remove the pan before refrigerating? Hi Ashley, I just made this last night and couldn’t wait to try it this morning! Worth the wait the sweetness of the crust pairs perfectly with the tartness of the lemon. Thank you for this recipe! I made this yesterday and it was so good! Turned out beautiful. I did cook it for 10 extra minutes. You are a life saver! Making this for my son’s birthday this weekend. Looks gorgeous. Hi! I want to use your recipe without the blueberry swirl sauce because we don’t have fresh blueberries in our country. We only have canned pie filling/topping. 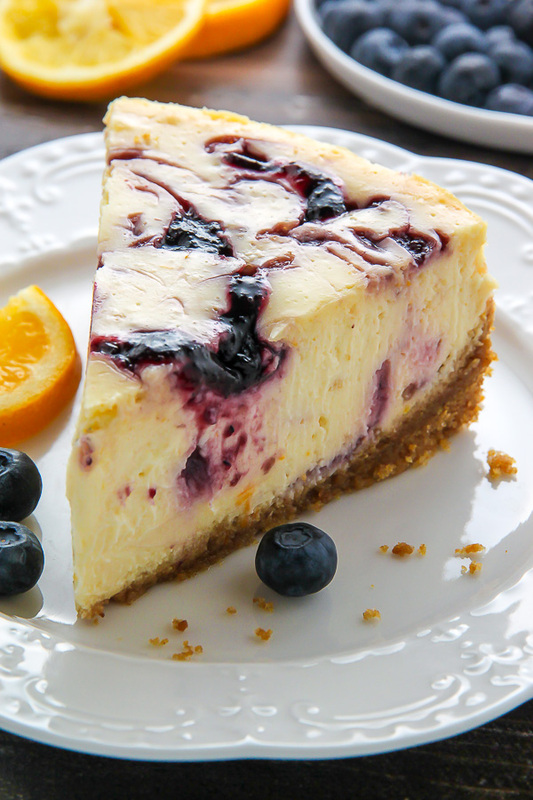 What adjustments do I have to make (baking time, ingredients measurement, etc) if I’m only going to make plain cheesecake using your recipe and just use the canned blueberry as a topping? A quick response is much appreciated as I’m going yo make this for my boyfriend’s birthday. Thanks! Hi Richelle. I haven’t tried this recipe with canned blueberry topping so I’m unsure what adjustments would need to be made to make it work. You may need to add additional baking time – I would start with 15 minutes and see how it looks. Thanks you for the quick response! But if I am going to make just the plain cheesecake using your recipe sans the swirl, should I need to adjust the baking time? The texture of the cheesecake was perfect! I did do some tweaking to the recipe and it still came out really good! i up the lemon juice by adding one more lemon to the 3/4 c and adding more lemon zest (4 lemons total) and 2 drops of lemon oil (for extra tartness). Also reduce the amount of sugar by a tablespoon in the blueberry sauce so it’s not too sweet and also added about 2 teaspoon of cinnamon in the crust. The outcome was DELICIOUS! However, I wouln’td trust the one hour and 20 min in the oven. Every oven is different, I did it just that and it overbakedso you have to know and gage your oven. Keeping an eye on it after an hour and ten minutes. it will still jiggle, but i think the key is leaving it in for the extra 40-45 min and not opening the oven at all. I also let my sit for 12 hours before serving and folks really enjoyed it! another trick to keep the wetness out is wrapping the bottom of the springform pan in foil to avoid any water from seeping into the pan. Sample shown here: https://www.afamilyfeast.com/how-to-bake-using-a-water-bath/ Or you can put the springform pan in a cake pan and then the cake pan in the water bath. This was delish!!! I would of never thought that lemon and blueberry would go together. I got so many compliments it turned out beautiful. Is it possible to place this cake in the freezer to chill (but not let completely freeze) in order to speed up the chilling time if I don’t have 6 hours? I followed the exact recipe, not changing anything. I even left the cheesecake in the fridge for 12 hrs before slicing. When I did slice the cheesecake, the entire center was runny. Hi, I’m gluten intolerant, can I leave out the flour? I bake a lot of cheesecakes and wanted to try this recipe. I do have some advice for those who are having trouble. I never use a water bath, too much hassle and you don’t need it. I used reduced fat cream cheese and reduced fat sour cream, and had no issues. I also changed the eggs to just two eggs and two egg whites. It’s very important to bake cheesecakes until they are fully done. You want a slightly jiggly center, but if the center seems very wet and runny still, it needs more baking time. I thought this cheesecake was ok, but it’s wayyyy too much lemon juice. I like very lemon-y desserts but this was too much. I would reduce the lemon juice to 1/2 cup, possible even less. A decent recipe, but needs some tweaks. DELICIOUS !!!!! I am not a baker or a cook but I had to make a cake for our work Bake Off and I chose this as I love cheesecake – I followed the recipe exactly except I used Digestive biscuits instead of Graham – and I always use gluten free flour – but it was absolutely delicious and my workmates LOVED it – thank you I will definitely be making this again. I made this over Christmas, and it was so delicious! I’m making it again today for my birthday tomorrow so lets hope I can replicate it once again! Thank you for the great recipe! Hello…im planning to try out ur recipe soon..however i could not figure out at what step should i remove the cheesecake pan from the water bath?before 45 min in the oven or after or it should remain in water bath until put in the refrigerator? I’ll for sure make this again! Wish I could attach a pic of this beeauty! It worked perfectly. Amazing tast and texture. Awesome cheesecake- everyone was raving about it at Easter. I left it in the oven for several hours after turning off the heat and made it two days ahead of time and it was perfect. If I use a 10” springform pan how would that affect the recipe and cook time? 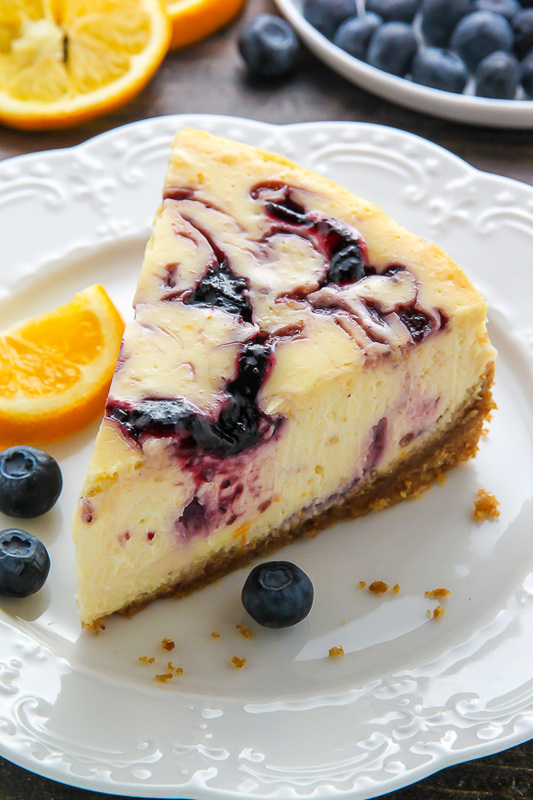 I just use the ‘no bake’ lemon cheese cake recipe and then cook down some blueberries, sugar and water. Let it cool. Dollop it on the top. Yummy. No baking perfect. Very easy. Can I sub in non fat greek yogurt for the sour cream? How will that affect the texture, cook time, etc.? Can I use powdered sugar instead of granulated? I tried this and it cam out great. I did changed the crust from Graham Crackers to Lemon Snap cookies. it came out FANTASIC! I would suggest adjusting the order of the instructions, as another commentor mentioned. The instructions for the blueberry swirl are at the bottom, so when i got to the step where I need to add it, I didn’t have it. Also, to put the foil layers on before filling it with batter. (maybe obvious, but I’d adjust that too). Mine is resting in the oven now. Worried about how thin the batter was. Especially since I only have 4 or so hours to let it chill! At least my pan is 10in. Hopefully that helps! My cheesecake is turning brown and there are still 10 mins left for baking. The top also cracked. I put a dish of water under the rack because I didn’t have any baking dish large enough to put the cheesecake inside. I’m wondering if that was the issue. Does anyone know if this particular recipe is freezer friendly?